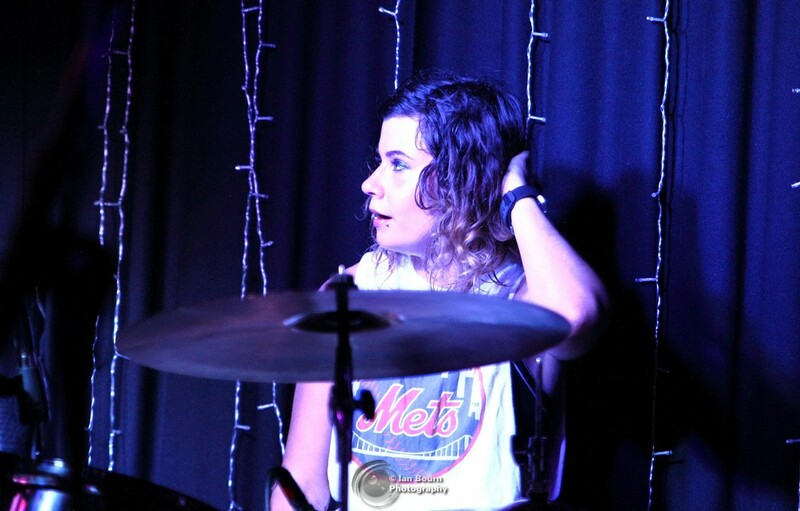 Review: Ramonas - Blitzkreig Bop over Brighton! - art noise. 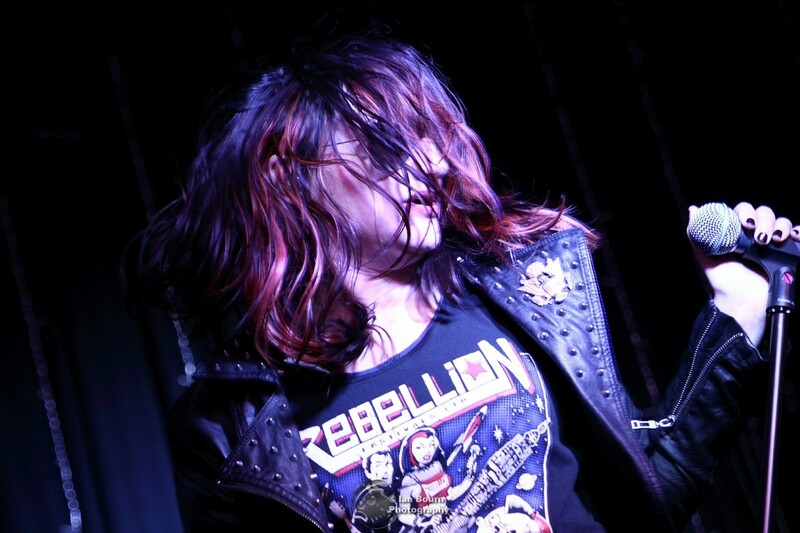 Home » Noise » Live Reviews » Review: Ramonas – Blitzkreig Bop over Brighton! The Ramonas arrive in Brighton. Guitars, drums and baseball bats and then turn it up to 11 at The Prince Albert in Brighton. Guests of The Ramonas for this gig were the fabulous Brightons own Dirt Royal guys. Dirt Royal are: Charlie Russell: lead vocals/bass, Leon Fenton: lead vocals/guitar, Loz Hood: drums and vocals. Dirt royal never disappoint. Leon on point with guitar and vocals, sharing vocals with Charlie on bass and Loz behind the kit keeping everyone in line! A great set of their finest for the busy Albert and included Factory Fodder, Army Of Dogs and It Was You. 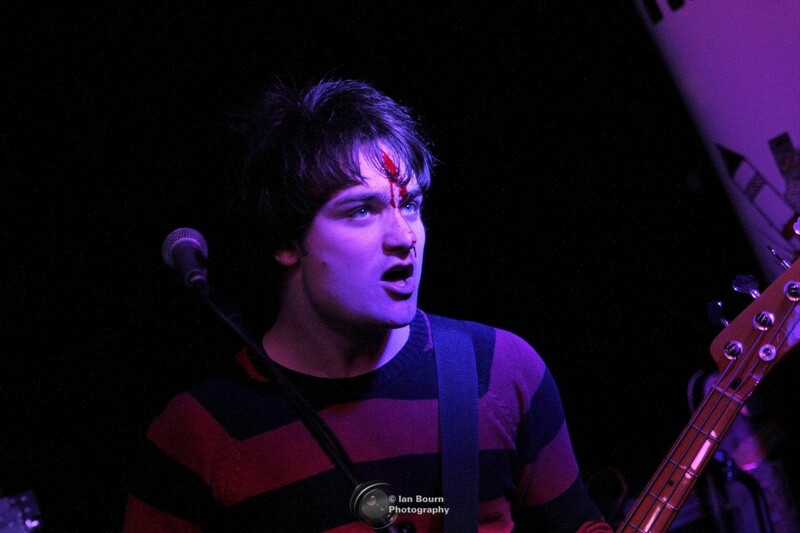 During the last track, Great Expectations, Charlie did one of his trademark leaps and split his forehead open on the tuner / head stock of his guitar. Blood flew everywhere, and I do mean everywhere! Charlie continued with blood pouring down his face, into his eyes and dripping off his chin. Punk rock – yeah! The Ramones did a track called Texas Chainsaw Massacre – and I did wonder if The Ramonas were going to include it during their set! 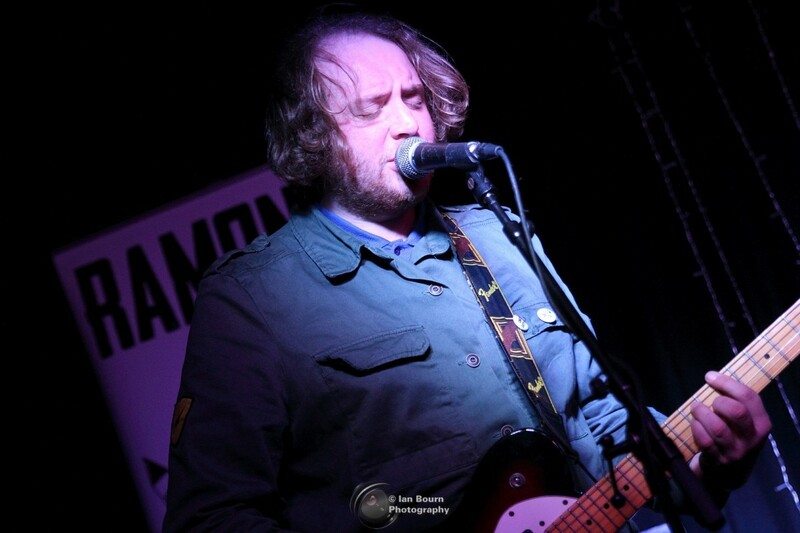 Well played Dirt Royal – and respect to The Ramonas who dashed to Charlies aide whilst dealing with a mic stand that developed a mind of its own. This was going to be interesting, and I had been looking forward to this. I have met the originals a few times and road-crewed for them on the Rocket To Russia tour. Had a few chats with Joey and Arturo Vega, and the others – including Tommy who was drumming for the band back then. Anyway… that was then – Do You Wanna Dance? 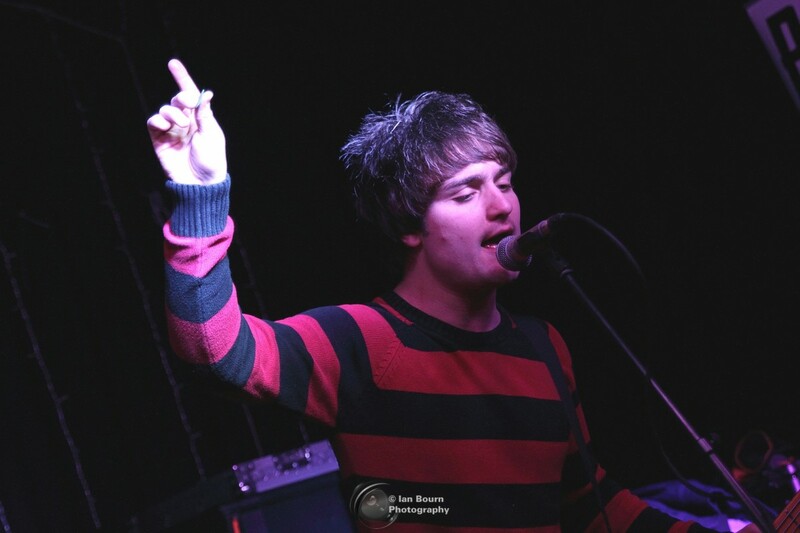 The Prince Albert in Brighton was packed out and the audience were ready for this! Pee Pee hit us with ” 1-2-3-4″ and The Ramonas kicked into life with Lobotomy, Pyscho Therapy, Judy is a Punk and Loudmouth. Hell! These guys, like the originals/namesake, absolutely came at us faster than a speeding bullet, mixed in with a frenzy of authentic sounding buzz guitars, bass, drums and scorching vocals. I watched Rohnny, and yep like Johnny Ramone – down strokes only – well played! Every song, from beginning to end was pure energetic punk injected nostalgia. She had her guitar set to replicate the Mosrite guitar sound that Johnny made his own. And she played that guitar, well beat the hell out of it actually, creating a genuine Ramones sound that filled the Albert with a unique tone and range. 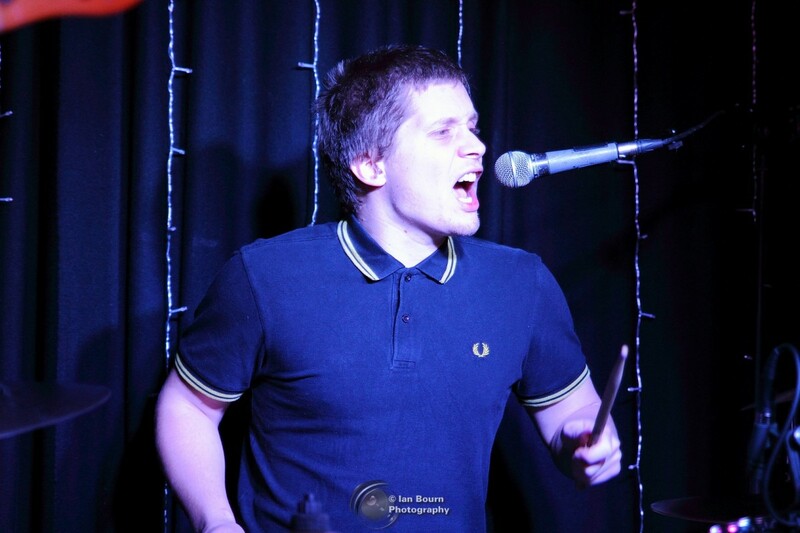 On drums was Cammy who had recently joined the band. Had a quick pre-gig chat with her and was great to chat about the upcoming evening and tour so far, they were just back from a big European set of dates. She can play! Any of Ramones drummers have proved their worth, but Cammy provided the Ramones basic sound for the tracks – but added more and provided a powerful support to the band with flying hands and hair! Stunning performance from Cammy. Pee Pee had the task of delivering the 1-2-3-4’s through the set. It was just fab to have a few words with her pre-set as we watched the venue fill up. Make no mistake these guys have done their homework – all stances and playing techniques on point. It was a lesson in punk bass playing watching Pee Pee as she thundered at us with her own gut dislodging bass thunder. Bass and drums working as they should in partnership. Awesome job Pee Pee. They do not stop as classic Ramones tracks come at us fast and furious. 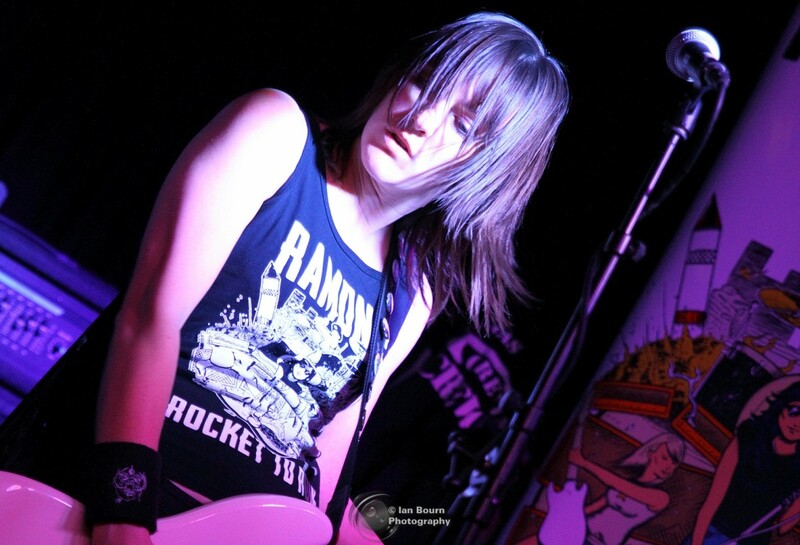 Chloe is lead vocals for The Ramonas. She has the attitude and the walk as she headed out on to the stage through the crowd with a confidence you get from experience. The audience began to jump about, chant and sing before Chloe said a word. It was quite extraordinary to witness. She fist pumped the crowd at every “Hey” and you know what? we loved it. She was a lot more animated than Joey ever was and she hurled the mic stand around the stage. The lights shining on her, Chloe appeared in her black leather jacket wielding a baseball bat, huge sunglasses and a snarl that would do the song proud! Beat On The Brat and she wielded that bat around the stage without hitting anyone! I had seen Johnny armed with a bat at a gig and he was actually was going to use it on someone who was down the front! In true Ramones style, the guys fire at us about 30 tracks with speed, precision and their own brand of attitude. All the songs were there. How do you chose from such a catalogue? Rockaway Beach, Glad to See You Go, and more. The songs seemed to span most of the album releases from the Ramones. One song missing, in my opinion, was Sheena is A Punk Rocker but they did deliver the Motorhead classic RAMONES. The gig also saw the release of their new EP “You Asked For it” The Ramonas played a couple of tracks for us. The EP is packed with 5 tracks, and like their namesakes each track is a 2 minute blast of punk energy fueled with angst and stitched with lyrics that bite. But importantly this is their music. 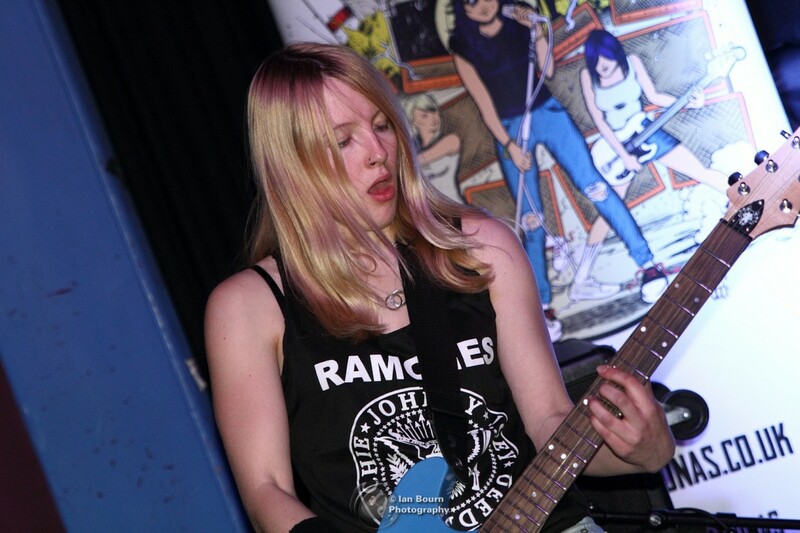 Its a CD that will be played often – no fillers – just Ramonas Killers! This is a great EP – if you go to see The Ramonas make sure you grab a copy. The set continued apace, more great songs and “Pinhead” was announced as the last song. The packed in crowd went nuts – “Gabba Gabba…” and as the song approached the end on to the stage came a character waving the “Gabba” placard high above our heads. A swift encore finished up with Blitzkreig Bop. Wow what an hour that was! Great fun and a damned good reason to go out, support local venues and bands on a Sunday night. So Ramonas… did you cut it for me? YES absolutely they did! Some folk may not like “covers” bands. I witnessed a band that did indeed pay tribute, they were fast and loud and fired at us a great selection of tunes and delivered to us giving our eardrums a great work out. This may be as close as some folk will ever get to hearing theses songs done live. But, don’t forget, The Ramonas in my view surpassed that “label” as they have now released their own material in their own right and so huge congrats to them for that, and it is a blistering silver disc. The band made up with four female musicians who just happen to be huge Ramones fans. They travel the world playing the songs made famous by The Ramones. 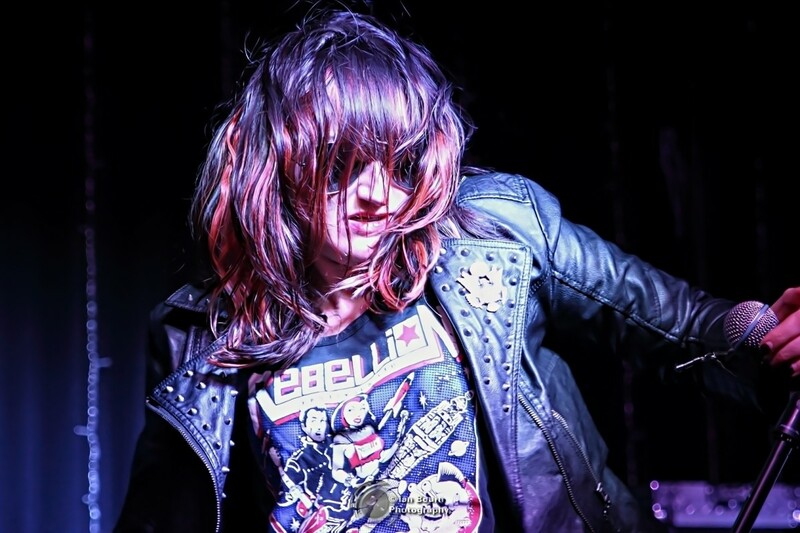 The Ramonas have got to be one of the only “tribute” bands worth seeing – so grab your old/new Ramones T and Lets Dance! Please note all images / video are copyright, please do not copy. If any of the featured artists want copies of the images – or more if available – please get in touch.